Buffalo Field Campaign has seasonal openings for field volunteers. We have opportunities for every season, but are in great need of folks during our field season which runs from November through May. 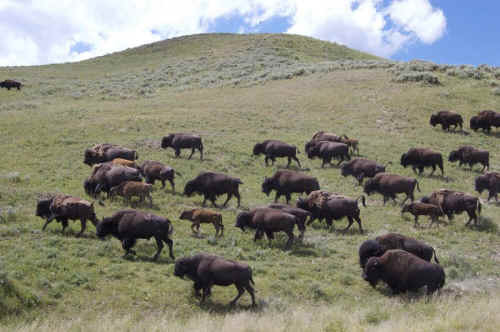 This is the time of year when wild bison are migrating into Montana and facing death and harassment. Any buffalo within Montana's borders is in danger of being shot on sight, hazed, or captured and shipped to the slaughterhouse. All volunteers are provided room, board, gear, and training in exchange for staffing our field patrols. We cater to most any dietary need. We are located in a warm log cabin by beautiful Hebgen Lake, just a few miles outside of West Yellowstone, Montana, and we also run a camp north of Yellowstone, in the Gardiner Basin.